When visiting Chiang Mai, very few tourists care to put Chiang Dao on their travel itinerary. Most of them tend to pass by this quiet little town which is on the way to Fang and Tha Ton. Some stop over briefy at the famous Chiang Dao Caves but then quickly hop off to other better-known tourist destinations. Chiang Dao is relatively unknown to tourists and hence it's not a popular destination. 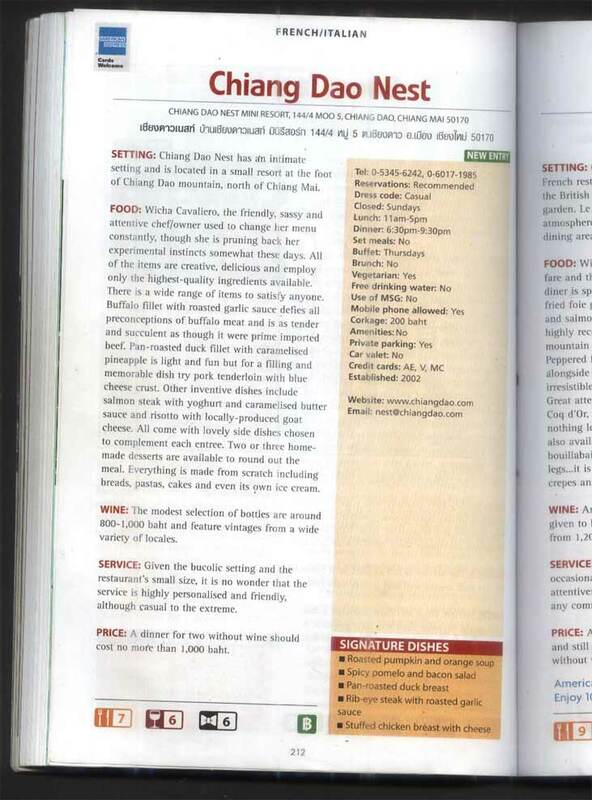 Even the backpacker's travel bible _ Lonely Planet _ contains very little information about Chiang Dao. But that has been a blessing in disguise because it has made Chiang Dao Chiang Mai's best-kept secret with the result that the town continues to retain most of its natural charms and beauty, still insulated from problems associated with mass tourism. But that is bound to change now that a very concrete attempt is being made to expose Chiang Dao and its secret treasures to the public. Thanks to the efforts of Mr Stuart Cavaliero, an Englishman, and his Thai wife, Wicha, the self-proclaimed ambassadors of Chiang Dao who run a resort there, the town is becoming increasingly popular among travellers who love nature and want to stay off the beaten tourist track. Their inspiration? To attract tourists to Chiang Dao Nest Mini Resort, a facility they operate in the remote recess of this mountain town. But there is more to it. It's love and a passion for natural environment the couple enjoyed on their first visit to Chiang Dao in January last year that inspired them to settle down in this remote town. They initially booked for two days at the secluded Malee Nature Lovers Resort but were so taken up by the peace and serenity of the surroundings that they stayed there eight more days. "I love the peace, tranquility and mountainous scenery here," said Cavaliero. "And I think other people would love it too." So they decided to make Chiang Dao their second home, their first being Norwich city, England. Looking around his resort, it's easy to understand why. It's surrounded by mountains on all sides. "Hills on the left, hills on the right, hills before us and hills behind us. It's like a cottage in the middle of a jungle," he said. In the morning you wake up to the chorus of birds singing and chirping breathing clean fresh air and the sight of huge trees and lush rolling hills all around you. No wonder why the Cavaliero family decided to settle down here, in this peaceful and tranquil environment. "Also, because we wanted a place where we could raise our baby," said Wicha cuddling her two-year-old son, Joseph. "We think this is the perfect place." 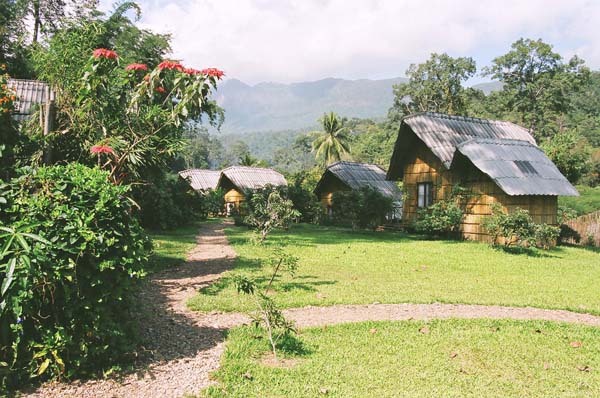 Last September the couple moved to Chiang Dao and began building the resort. The Chiang Dao Nest Mini Resort is already welcoming guests offering them simple yet warm bangalow-style accommodation, unexpectedly good Western food and a certain level of comfort the easy going holidaymaker would cherish. The resort is complement of six bungalows offered at a very affordable price of 250 baht/night. Each bungalow can accommodate two persons. Since the resort is now operating it's necessary to ensure that tourists know of its existence. But instead of promoting the resort singly, Mr Cavaliero thought it would be better if the entire town was packaged and promoted as a tourist destination offering plenty of attractions and adventure to the visiting traveller. He has created a website, www.chiangdao.com, to disseminate information about Chiang Dao. The website contains information on Chiang Dao, its attractions and, of course, his resort. It also contains information about other boarding and lodging facilities in town. Mr Cavaliero is taking the task of promoting Chiang Dao as a personal challenge. His strong retailing, marketing and communications background should stand him in good stead as he goes after his mission _ a mission driven by his love for Chiang Dao. He said there are so many interesting places still unknown to tourists and waiting to be explored. Most tourists only know Doi Luang Chiang Dao, Thailand's third highest mountain peak and the scenic Chiang Dao Caves. Other attractions are virtually unknown. 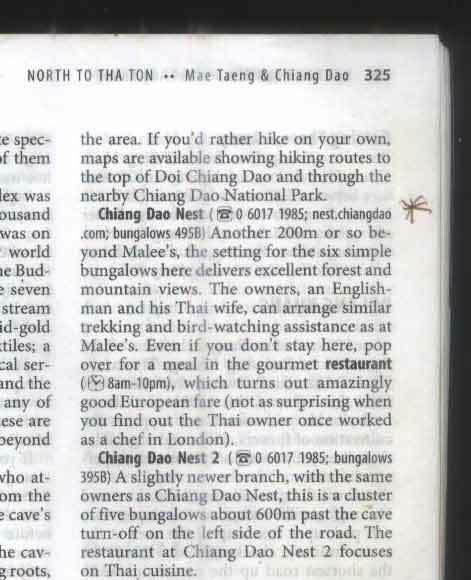 "This makes Chiang Dao an interesting place to explore,'' he said. In fact, one doesn't need to venture very far from the resort to get a taste of what Chiang Dao has to offer. A simple observation of the surroundings around the resort will give you an idea of the kind of a peaceful natural paradise that Chiang Dao is. At dawn and dusk you will find the gentle breeze and the melody provided by countless birds enchanting. Chiang Dao is a good bird-watching destination. It's home to more than an estimated 300 species of birds, although it's not as frequented as Doi Inthanon, the most preferred bird-watching spot in Chiang Mai. Chiang Dao also offers other interesting activities for nature lovers, such as mountain climbing, jungle trek, visiting hilltribe villages and even meditation. You can also visit the villages for a taste of local norms and culture. About 1.5 kilometres from the resort is Doi Chiang Dao peak which rises 2,225 meters above the sea level. On request the resort can organise a 3-day/2-night trek to the summit of Doi Chiang Dao accompanied by local guides. Less adventurous tourists can opt for nature trail in Chiang Dao Wildlife Sanctuary where you can enjoy light trek in forest settings. For those who crave inner peace and want to calm their minds, there are two meditation centres. Near the resort is the Wat Tham Pha Plong founded by the highly-revered monk, Luang Poo Sim. Then there's Matadee Ashram, a Hindu centre, and Mae Yogi. Both places are within walking distance from the resort. For those interested in cultural diversity, Chiang Dao is home to many ethnic tribes, especially the Lisu. We visited Baan Na Lao Mai and Baan Fah Suay. To us, the simple lifestyle and the sight of the villagers wearing brightly coloured traditional costumes and ornament came as a nice bit of a surprise. The villages still retained most of their original charms. From the many hilltribe villages I have visited over the years these two stood out because tourism hasn't made inroads yet, and although we did spot some men dressed like city people the women were clad exclusively in their customary robes. They spoke their own dialect. The pace of life was easy and peaceful. At Na Lao Mai we met Alima, a local girl who impressed us by speaking perfect Thai. There was no pestering of tourists, no shops or stalls selling local handicraft or souvenir, and no attempt to go after tourist money. It was more like visiting a friend's house. The way the villagers responded to our presence was very characteristic of the Lisu hilltribe people. Although they welcomed us, they still kept their distance. Na Lao Mai and Baan Fah Suay were just two of the hilltribe villages that we visited. There are many more. For adventure travellers there is plenty to explore. Among the attractions are waterfalls and caves but getting there can be a test of endurance for the visiting tourist because the terrain is rocky and mountainous. It seems the efforts of the Cavaliero family is beginning to bear fruit. An increasing number of tourists are now visiting Chiang Dao to explore its cultural diversity and rich heritage. So next time if you are going to Chiang Mai for a holiday make sure you also include Chiang Dao on your itinerary. Rest assured, there will be plenty to discover and explore. From Bangkok air-conditioned coaches and buses leave Mor Chit Northern Bus Terminal ( tel.02-537-8055) for Chiang Mai every day. Thai Airways (tel. 02-628-2000) offers daily flights from Bangkok to Chiang Mai. Visitors can also travel there by train. Trains leave Bangkok's Hua Lamphong Railway Station every day. In Chiang Mai go to Chang Peuk bus station and take the bus that goes to Tha Ton or Fang. Ask to be dropped off at Chiang Dao, outside Alien Bar. 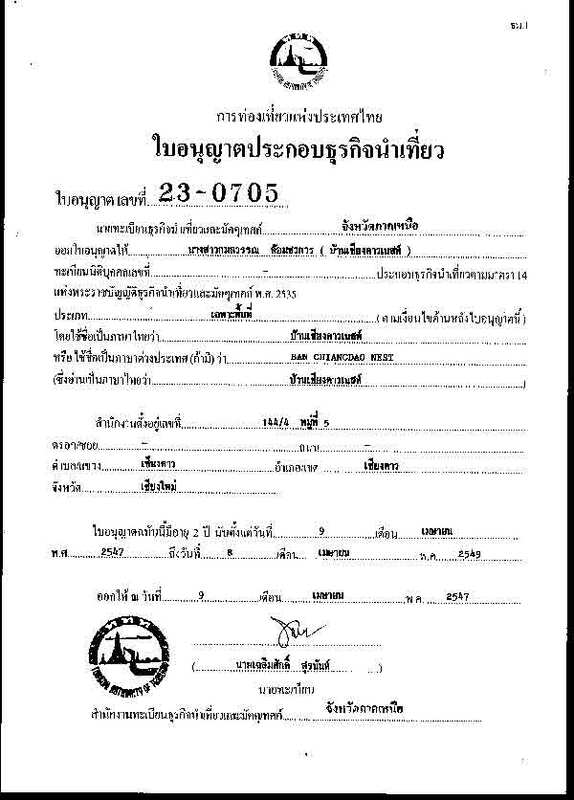 The fare is 29 baht per person. From there you can take a taxi to the resort which is 6.5km away. Chiang Dao Nest Mini resort provides bamboo bangalows. Renting a bungalow costs 250 per night. See details at www.chiangdao.com. Editors note: Our prices are no longer at this rate, and we now have rooms available with private facilities, please click here for current details.